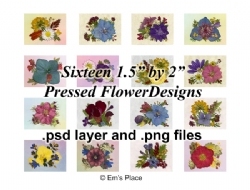 An assortment of sixteen digital pressed flower designs. ~ Pressed flowers and/or leaves are are picked and pressed by Em in the Pacific Northwest and then designed into arrangements. They are then scanned or photographed and each item is placed on a transparent background for use. This way the user can make an arrangement simply and conveniently. The great thing about having a .psd layer format is each item is ready to move around, arrange or adjust to our liking. In order to take advantage of this convenience you will need a program that can open this file type - Adobe Photoshop. see our video about how to do this. Please refer to the digital use policy page. No shipping/handling will be incurred for digital download items and watermark on large image will not be included.